Since imported goods from Britain have been cut off, the Americans had to make their own goods. This stimulated and hastened the pace of industrialization. The newly obtained independence gave a rocky start to the Americans; however, that soon changed when they were able to trade freely with foreign nations (particularly in the Baltic and China Seas). But still, overall the economy was still a little "lop-sided" since State Government borrowed more money than they can repay during the Revolutionary War and Congress was unable to successfully to control economic laws. There was a new rich-class who made their serious profit from the trade; some of the old rich class are now poor. regulating commerce. This led to the division of the states, so, on Jan.
By 1790- the population has grown to about 4 million. The National Debt was $75 million due to Treasury Secretary Hamilton (who became the "Father of National Debt" ) who set out to correct the economy; one way he did it was to urge Congress to take on the states' debts. Hamilton proposed the usage of tariffs to pay off the debt and gain some revenue. He also urged the Congress for a national Bank. The Bank of the US was created in 1791; one fifth was owned by the gov't and the rest was stock for others to buy. The Federalists established a strong gov't and put in taxes on houses, land, and slaves to pay for the expansion of the army and navy. 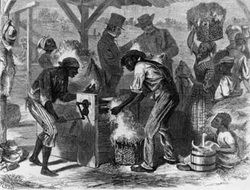 The Cotton Gin was invented in 1793 and slave labor based plantations were able to expand. The cotton was shipped to textile mills in Britain, France, and New England and improved the Cotton industry.